The aerostructure tooling market - which is key in the production of new planes - is in flux. After a number of sluggish years, production rate increases, new aircraft programs and greater automation have sparked somewhat of a revival. We are optimistic that the growth dynamics will remain intact and present three scenarios for the development of the market over the next five years. Automation is one of the key drivers of growth within the aerostructure equipment market. 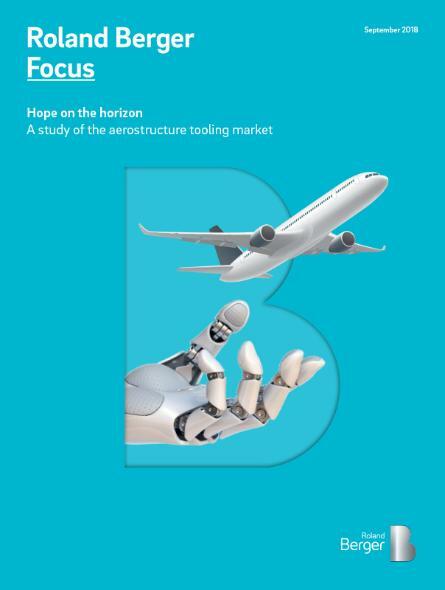 "Hope on the horizon" is the third study on the aerostructure tooling market by Roland Berger. Since we published our first study in 2012, the market dynamics have changed significantly. In 2012 the production of both the A350 and the B787 was still in an early stage and the market was rather stagnant. Three years later, the production rates of the two programs had already increased, automation was picking up, the demand for eco-friendly aircraft had risen and business became more dynamic. Currently, the upbeat trend continues: The rate for legacy programs has gone up, new projects such as the B797 have started, automation is rapidly becoming more important and the service business is growing. Moreover, new competitors are entering the market, industrial expansion has increased and OEMs are promoting secondary sourcing. For the current study Roland Berger experts interviewed experts in nine countries. The established model of market drivers helped to assess the market. It also led to three possible scenarios for the economic developments of the industries of the next years. All of them offer a positive outlook although to varying degrees. "Everyone underestimates the market," says a CEO of a leading tool supplier. "History has shown that the market has countered all the forecast downturns." The base case represents a conservative view. Only announced production rate increases and new aircraft projects are taken into consideration. The automation penetration rate will rise to 60 percent, from currently 30 percent. The estimated annual growth reaches 3.4 percent in the years 2018–23, taking the size of the aerostructure tooling market to USD 2.7 billion, from USD 2.3 billion in 2017. Some of the experts, who were interviewed for this study, believe this scenario to be the most likely. The enhanced case features an optimistic yet realistic scenario. It foresees production rate increases for aircraft progams such as A320neo, B737 and F-35 that go beyond current announcements. In addition, this scenario assumes a higher degree of automation, at 65 percent. The forecast annual growth rises to 6.7 percent in the years 2018–23, with total market volume hitting USD 3.35 billion. A few of the experts who contributed to this study assess this scenario as possible. The aggressive case appears highly optimistic and also feasible, yet as the least probable of the three scenarios. 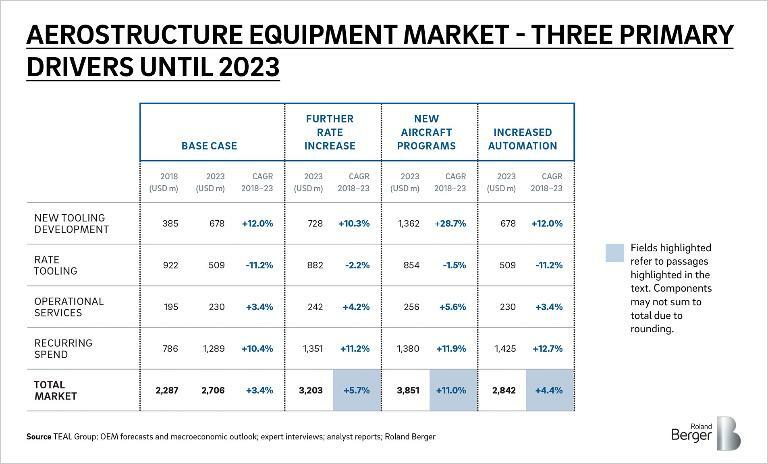 It assumes major new aircraft programs will start in 2025 and an accelerated penetration of automation in production. The forecast annual growth jumps up to 11.9 percent in the years 2018–23, taking total market volume to USD 4 billion in 2023. We believe that the base scenario will most certainly be achieved, and that there's a strong case to be made for the enhanced case, assuming that the current market dynamics continue. It is our belief that further rate increases over and above the latest announced figures are likely. Underlying demand for air travel capacity is not expected to slow down. 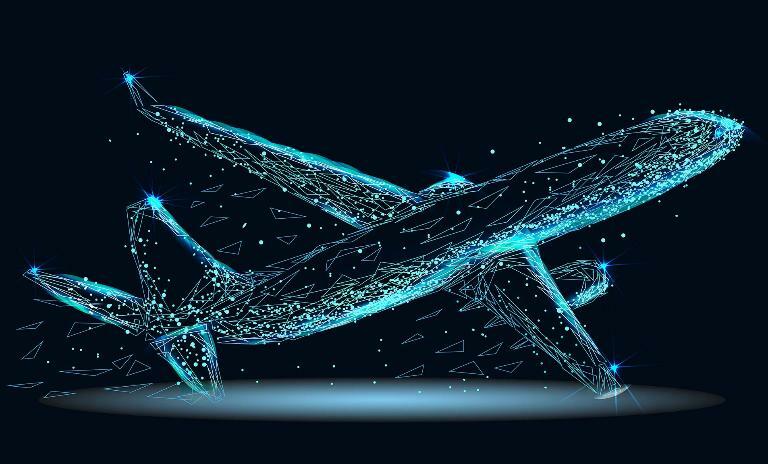 Tooling demand for new aircraft programs and production rate increases are mainly driven by OEMs' decisions, so the pivotal aspect for suppliers is likely to be automation. "There is pressure on price, but it is driven by OEMs reducing costs rather than competition in the market," states the Sales Manager of a Tier-1 company. "So, the demand for automation is strong." Investment in new production technologies could make the difference between moderate and significant market growth. Suppliers should position themselves at the forefront of automation, not just mastering the technical aspects of automation but also crafting a solid business case for convincing OEMs to buy automation enhancements. The study "Hope on the horizon" provides an optimistic outlook for the development of the aerostructure equipment market. Suppliers should invest into automation.